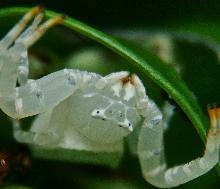 Predatory mites have become increasing important in IPM systems especially indoor systems. 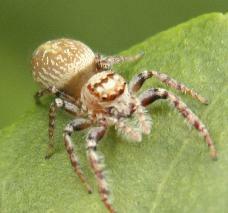 Persimilis, a voracious predator of twospotted mite, has been mass reared in Australia for about 30 years. In the last decade more species have been collected from the wild and mass reared - Cucumeris, Typhlodromus, Montdorensis and Victoriensis. All these species and numerous other native species can occur in crops to various degrees. 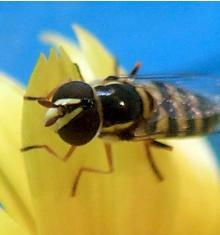 Key identifying characteristics: The adult with its black and yellow and black banded abdomen is often seen hovering above plants. The adults feed on nectar and pollen. 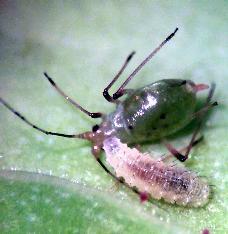 The female lays its white oval eggs amongst colonies of aphid or mites. 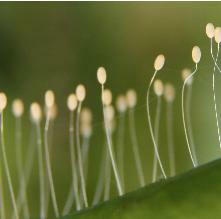 The eggs yield maggots which feed on aphids and mites. The pupa is tear shaped and found under leaves or in leaf litter. There are many species of lacewing - green and brown lacewings are the most familiar to farmers and commonly occur in crops. The green lacewing - Mallada signata - lays its eggs in groups on fine stalks - the image in the web page header is of green lacewing eggs. There are also many related species which are useful predators. Lacewing are commercially mass reared. 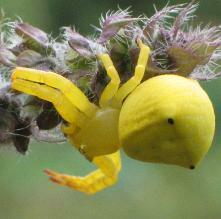 Many species of spiders are found in crops and are likely to vary from crop to crop and from district to district. Foliage dwelling e.g. 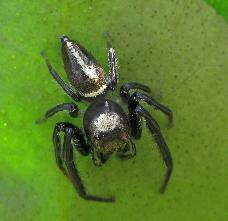 jumping spiders, lynx spiders, nightstalkers, flower spiders, crab spiders. 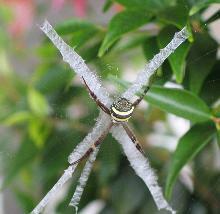 Web spinners e.g. orb weavers, tangle web spider. 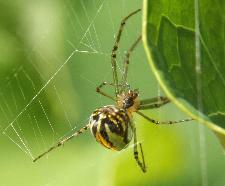 The ground and foliage dwellers are likely the most important spiders in caterpillar pest control although the odd moth can be found in the webs of orb weavers. Major Hosts are moth eggs, small to large caterpillars. How significant spiders are in pest control is difficult to quantify but they are often the first predator to appear in commercial crops and commonly make up 30% of the predators found in sweet corn. Ants feed on moth eggs and small caterpillars, wireworms.. Some ants are good predators. In vegetable crops, they are usually more numerous near the edges of fields where they can travel from undisturbed ground where they have their nests. They can remain at moderate levels in minimum tilled ground and in lighter soils and can be a significant predator in drip irrigated crops where patches of soil remain dry. Ants occur in most orchards and can be contribute to pest control however they may disrupt the activity of other biocontrol agents and can farm aphids.